Shirdi Sai Devotee Gowri Oberoi from from India says:I Gowri Oberoi wish to share how Baba again blessed me today. I had planned to walk down to the Sai temple near my house which is about 1 km away from my home. While walking I wished to get a coconut and offer to Baba but there was no dry coconut store and only a green coconut shop was there so I didn’t take as green coconut isn’t usually offered. I didn’t know the Aarti time etc but exactly when I reached there the Aarti began. I was blissful and enjoyed the full aarti. I also noticed someone had already offered a coconut. During the Aarti I wished Baba to bless me by giving something savoury as His Prasad as I had given up sweets. Usually except on Thursdays when people get various dishes as Prasad, on other days only some sweets or fruits are offered to Baba and distributed as Prasad. After the aarti got over bhog was offered and I was surprised when I got warm Khichadi as Prasad with a big piece of potato on top! They also had kheer, paan and coconut as Prasad but since I had Khichdi in hand I didn’t know how to take the other things as I wished to take the Prasad home and share with my family members. But Baba wanted me to have the savoury Prasad first so Panditji said “Ye aap kha lo” (you eat this) and I had that Khichadi and then got kheer and coconut which I took home. Another thing was I wished Baba to wear blue but Baba in the main murti was wearing multi coloured vastra. But when I did pranaam to the small idol of Baba at the entrance and looked up, He was wearing blue matching with me. How sweet, loving and kind is our Baba Who cares for even small silly wishes that we make! Baba is truly love incarnate! 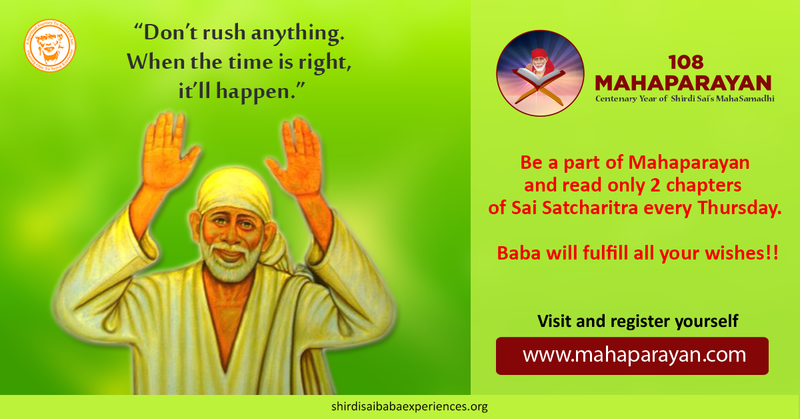 Sai knows all that goes in our mind and even the innermost desires. Once we surrender our mind to God completely, He will take care of us in every way. With this surrender comes peace, knowledge, devotion, bliss and salvation as well. Love You Sai Maa. Jai Jai Ho Sai...!